New Autofocus Platform – The XF Camera System marks an important milestone for Phase One -- a new patent pending and fully controlled in-house autofocus system: the Honeybee Autofocus Platform (HAP-1). New Flexible OneTouch User Interface (UI) – Based on clean Scandinavian design principles, the OneTouch UI is a seamless and highly customizable combination of dials, keys and touch screens, allowing photographers to personalize camera controls for their specific shooting requirements, via camera or software. Using a new modern Phase One Camera OS, the OneTouch UI is user upgradeable and will evolve in accordance with customer needs and feedback. New IQ3 Digital Backs – A new full frame IQ3 80MP digital back is the first of its kind to offer exposures of up to 60 minutes using a new and Phase One-exclusive imaging sensor. It joins the new IQ3 60MP and IQ3 50MP digital backs -- all three of which feature a high-bandwidth interface that enables advanced tools in the new OneTouch UI, including power-sharing capabilities. New Lenses Ready for 100MP and Beyond – Two new Phase One Schneider Kreuznach Leaf Shutter lenses -- 120mm and 35mm -- are both designed to resolve beyond 100MP. They add to Phase One’s range of 20 high-resolution medium format optics, including a dedicated Leaf Shutter range, a Focal Plane range, specialty and zooms, and support for 60 legacy lenses. New Capture One Pro 8.3 – Delivering the market’s best RAW image quality, more than 25 advanced photographic tools, and industry leading professional workflow, Capture One Pro 8.3 is built specifically for the XF Camera System and supports more than 300 different models of 35mm DSLRs. It offers the option to customize XF camera controls and delivers up to 30 percent faster tethered shooting. 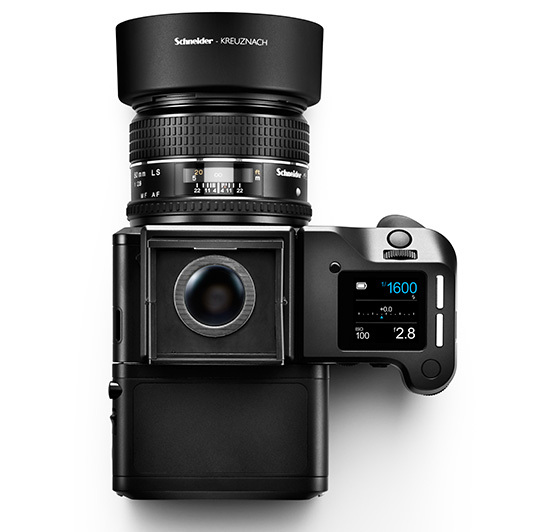 New Modular Viewfinders – The XF Camera System introduces a new 90° Prism viewfinder and a new waist-level finder. The full frame solid glass prism viewfinder is the brightest of its kind, and comes standard on all XF cameras. The new waist-level viewfinder (an industry classic) can measure exposure thanks to the HAP-1 autofocus platform ability to perform light metering. Upgradeable Camera OS – The new XF Camera OS powering its OneTouch UI allows for easy and fast upgrades that will provide both new features and unique customization in accordance with the feedback of our customers. XF Camera Systems users are encouraged to submit ideas and feature requests and will be able to easily upgrade their system at regular intervals to benefit from new features. Soft-configured controls – The XF Camera controls can be controlled from the camera or via tethered computer/mobile device. Three customizable dial and six customizable controls let photographers personalize the operation of each control to support their needs at any given time. Intuitive Touch - There are two touch screens: A 1.6” grip screen is designed for clear visibility under any lighting condition using a transflective capacitive touch display. On the back is a 3.2” retina touch screen designed to show high-quality image previews, with the ability to zoom to 100 percent with a single tap.